Get Your Free Coastal Living Guide Now! Is your neighbor an out-of-stater? As Memorial Day approaches we should all take a moment to honor and appreciate those who have fought to protect and serve our incredible country. This memorial day, make it all about spending time with the ones you love as you celebrate our veterans and the start of the summer season here at Compass Pointe. Nearby Wilmington has the perfect location for demonstrating your patriotism. Hop on board the Battleship NC and enjoy the Memorial Day Observance this year. Admission is free for this event and family friendly. The event includes a moving ceremony as well as some patriotic music. Carolina Beach is also kicking Memorial Day weekend off right with free live music at the gazebo on the Carolina Beach boardwalk and fireworks on the beach to end the night. It’s no secret that Compass Pointe has the best residents around! Why not get a group together, throw some burgers on the grill and make your own fun?! Memorial Day is an excellent time to get family and friends together to share stories of the past, exchange gratitude, and enjoy a delicious meal together. 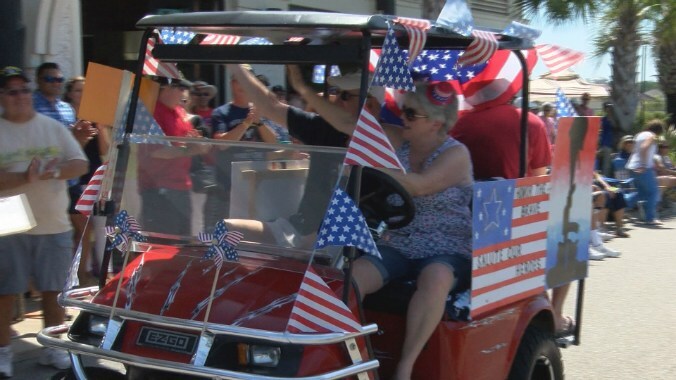 We also celebrate the holiday with a golf cart parade and ceremony, hosted by our amazing residents! If you can’t make it out to see a professional fireworks show, you can always celebrate in your own backyard. Fireworks are a wonderful way to cap off Memorial Day and welcome the summer season. Light some sparklers in honor of the veterans who have fought for our freedom. Every day is a celebration at our luxurious community oasis pool! You will feel like you are on vacation at an all star resort all weekend long. There is no better place to soak up the sun and entertain guests and the best part is, you don’t even have to leave the gates of Compass Pointe! Memorial Day is a day to remember all the brave men and women who fought for our freedom. What better way to show your appreciation than to celebrate those who fought and lived to tell about it. Take some flowers, books or cookies to a nearby veterans’ hospital. Make your own cards or decorate flags in honor of our troops! At Compass Pointe, we’re ALL ABOUT celebrating the unofficial start of summer and, having fun and honoring those that have served the wonderful USA! If you have any questions about life at Compass Pointe, we’re here to help! Visit our Contact Us form or call 888.717.6468 today! Email me about upcoming events.